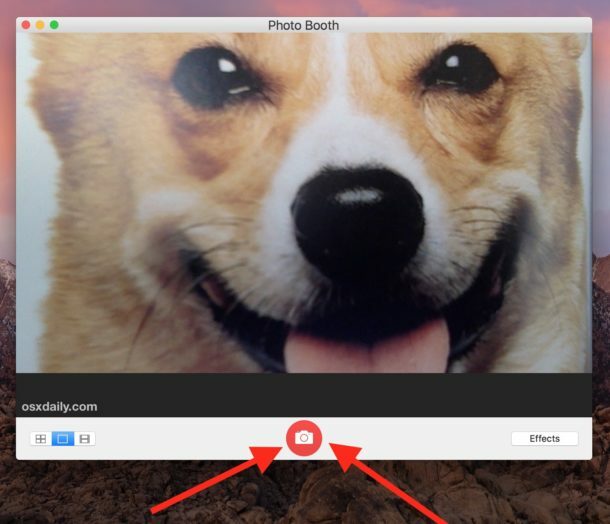 Have you ever wanted to take a picture with your Mac webcam? Maybe you want to post a new profile picture to the internet or send a funny face to a friend or relative. Whatever the intention, it’s easy to snap pictures with a Macs built-in camera, allowing you to take selfies with your Mac. Exciting, right? Nearly every Mac comes with a webcam built-in to the display, the camera is located near the top and middle of the screen bezel. Obviously if the Mac does not have a camera it won’t be able to take a picture, but every MacBook, MacBook Pro, MacBook Air, and modern iMac contain the bezel screen camera. The quality of the pictures will depend on the quality of the Macs FaceTime camera, newer models tend to have higher resolution cameras. Once you have captured a picture or two (or many if you are a selfie addict), you can save them. 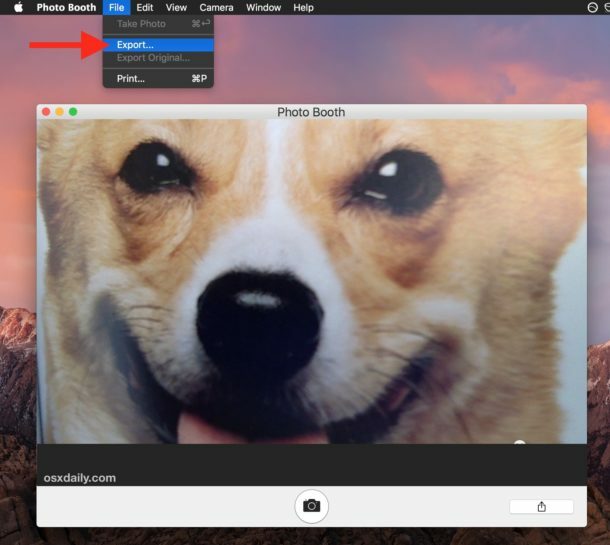 Photo Booth allows you to export pictures through the “File” menu and save any images as a file somewhere else in your file system. If you didn’t export a file you can also extract it manually by digging around for the raw Photo Booth file location. 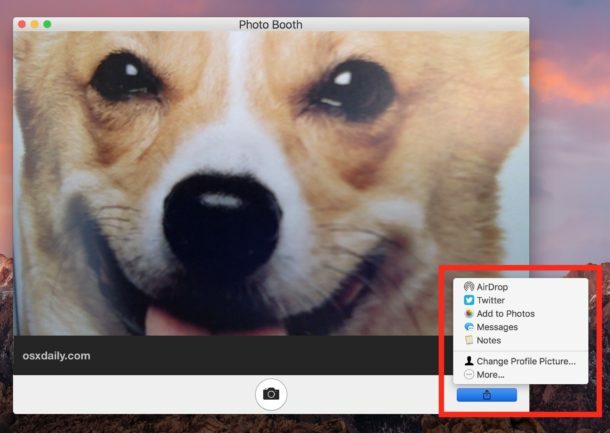 Another export option is to use the “Share” button in Photo Booth, this allows you to quickly send a photo through AirDrop, Messages, eMail, add it to notes or Photos, or post it to a social media service like Twitter or Facebook. Photo Booth can also take short video clips, but a better way to record video on the Mac using the camera is to use QuickTime. 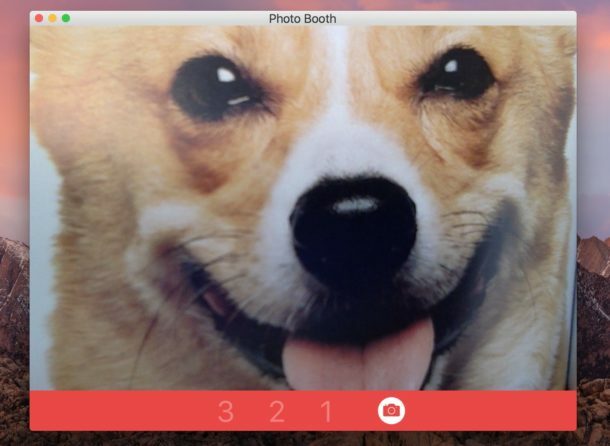 The Photo Booth app has several other tricks up its sleeve, you can disable the countdown or screen flash if you want, flip the images, use the app as a mirror (I’ve seen this multiple times), and if you really want to get crazy you can add additional hidden special effects to the app. By the way, if you disabled your camera or put some tape on the lens, you’ll need to address that before you can indulge in selfie-snapping with your Mac camera, but I’m sure you already knew that. 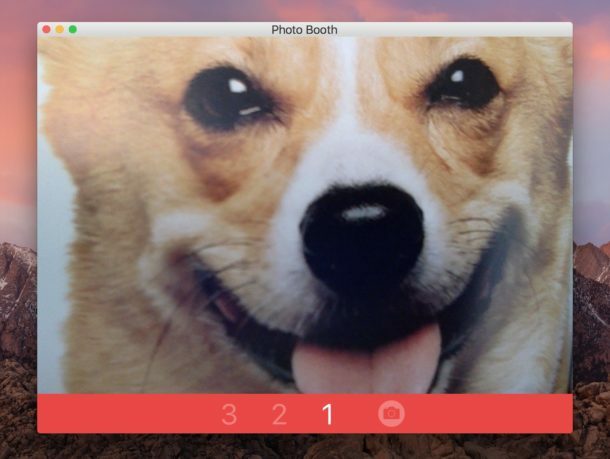 Have any other fun tips for Photo Booth, taking pictures with your Mac, or other selfie action? Let us know in the comments. I wish there was a camera app like photo booth but a bit better on Mac. Selfies on the mac aren’t like on the iPhone though. D’uh, there is it’s called Photos. Selfies taken with a Mac are no different, you’re in the picture. But then since you didn’t know that Photos was on your Mac, this comment doesn’t exactly surprise me. How to you take a photo without photobooth, and using an external USB camera? How do I reverse the camera so it looks out not in. If I want to take a photo ahead of me – not a selfie? I can’t find advise in any of your help bits. isn’t it obvious that computers don’t have a camera on the outside. LOL. Computers/laptops I don’t think they have a camera on the outside. (if u see one with two cameras send the link to me. never seen one in my life! You should consider getting a Reddcoin ID and registering with Basic Attention Token. People can leave you tips you can spend for your content. I would have tipped this work. I don’t have a photo booth. someone must of deleted it or something. HELP! I just wish Photo Booth had the ability to adjust the resolution of the camera. It always snaps with my webcam’s lowest quality setting of 640 x 480, but the camera is capable of taking stills at up to 1280 x 720.